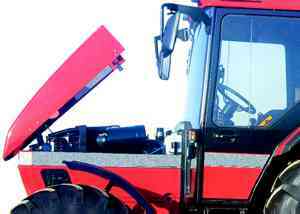 A major supplier of tractors had a problem, they needed a modified tractor bonnet kit for the European market. 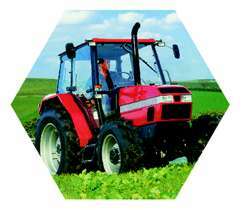 The problem was the range of tractors had a bonnet and side panels which were bolted to the tractor. This meant it could not be removed without first removing the fixing bolts, this took several minutes to accomplish. The need was to be able to release and lift the bonnet for quick access in the field, safely. An original version had been created using field modifications via the local dealers, a factory quality version was needed urgently if the market opportunity was to be grasped. Polydon engineers were called in. The brief, to create a simple to operate, easily manufactured, universal kit which was within a budget. Polydon accepted the challenge. Polydon engineers worked with the manufacturers personnel and their safety and aesthetic design criteria. Our design engineers created a hinge assembly and latching mechanism, here our C.A.D. 3 D design programmes were vital in helping create the components and calculate the critical dimensions. Once the working drawings were produced the prototype could be manufactured, these were fitted to a variety of tractors to test the designs. Field trials were carried out under the rigours of farm use for final inst- ructions from the client. Polydon Industries tooled up to manufacture 2000 units per annum, however the story does not end there, the resulting product was so successful that within weeks the forecast and therefore the production had to be increased 10 fold, which Polydon achieved.